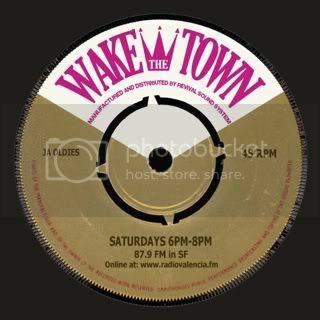 Tune in to “Wake The Town” on 87.9 fm Radio Valencia in San Francisco (also broadcast Live worldwide online at [radiovalencia.fm] every Saturday night from 6pm - 8pm for 2 hours of ‘60s Ska, Rocksteady and Early Reggae 45 rpm sounds! Brought to you by Adam (Revival Sound System) & Mateo (Sir Winston Ratchet) + special guests! I know you guys rep the foundation artists well! Here's some live Keith and Tex for ya! Hope to see you at the festival, we will be backing Keith and Tex and Errol Dunkley on the Village Stage on Sunday morning. Tune in to "Wake The Town" for shots of '60s Ska, Rocksteady and Early Reggae 45 rpm sounds! Wednesday afternoons 3pm-5:30pm on San Francisco's 89.5 fm KPOO (online at www.kpoo.com) Also every Saturday night from 6pm - 8pm 87.9 fm Radio Valencia in San Francisco (online at www.radiovalencia.fm) Brought to you by Adam (Revival Sound System) on Wednesdays + on Saturdays w/ Mateo (Sir Winston Ratchet) & Adam (Revival Sound System) + special guests! Tune in to “Wake The Town” on 89.5 fm KPOO in San Francisco (also broadcast Live worldwide online at www.kpoo.com every Wednesday afternoon from 3pm - 5:30pm for 2 and half hours of ‘60s Ska, Rocksteady and Early Reggae 45 rpm sounds! Brought to you by Adam (Revival Sound System) special guests! 1/8/14 Session w/special guest: Mike Crowell aka "King Papa Shirt"